This is the second attempt in two days for SpaceX. The Falcon 9 was originally scheduled to go up last night, but less than half an hour before the launch was scheduled to go, SpaceX pulled the plug and reset it for today. The reason was not, though, as many were speculating weather. Instead, it was to give the rocket’s liquid oxygen a little more time to chill. This latest Falcon 9 rocket launch attempt will take off from Cape Canaveral this evening. The launches to date have been typically smooth—the landings, however, have been harder to stick, with plenty of totaled Falcon 9s littering the path up to this one. It’s when Falcon 9 attempts to hit the “Of Course I Still Love You” that things are expected to go sideways (perhaps literally), as SpaceX is testing out a new, experimental orbiting plan for the rocket. But exactly how it will happen remains to be seen. It could crash straight into the ship. It could mostly stick its landing, only to tip over and explode at the last second, like last time. There’s even a chance Falcon 9 will prove everyone wrong and land itself neatly onto the droneship like it was no big thing at all. Even a crash wouldn’t be a total waste: it would tell SpaceX scientists more about what kind of trajectory they might want to plan for in the next round. Barring another last-minute cancelation, the launch window opens at 6:46 p.m. (ET) and the livefeed picks up 20 minutes before that. Watch along with us—we’ll be updating as it happens. Update 6:45 pm ET: At T-minus 1:40, SpaceX stopped the countdown, which also meant they had to scrub the launch again for today. The early reports from SpaceX are sounding like the liquid oxygen that caused yesterday’s scrubbing is at fault again—although this time the issue seems to have been in loading the liquid oxygen, not chilling it. 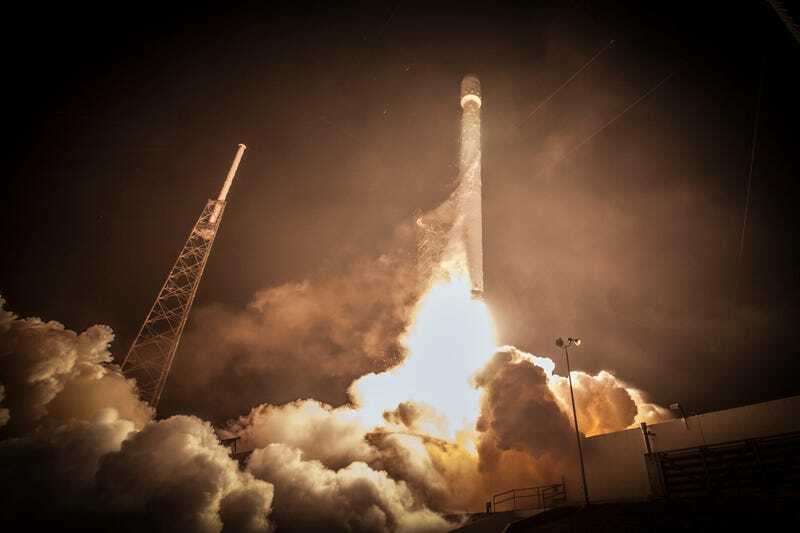 We’ve reached out to SpaceX to check on a new launch date and will update when we hear more. A previous version of this post appeared yesterday, for the original launch schedule. It’s been updated for today.